meetapp cool features credits comments? 7/7/2010: An iOS4 update is on its way! Tell me what you think. What would you like to see in Meetapp? 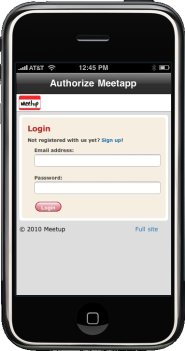 Keep in mind Meetapp implements all the public APIs that Meetup provides to third parties. More features will be added as more APIs become available. Thanks for the input.